I would love to live in an upscale department store. The clean lines, the clothes neatly folded or displayed and not crammed onto a single bar rack, whimsical window displays, plush furniture. Ah! I’m on an ever constant quest to make my room feel like an upscale boutique. I also love organization. I need everything to have a home. Especially jewelry! I love to be able to see what I have to get ideas on how to wear it. So I decided to make my jewelry a home of it’s own! It was super easy and now my bedroom looks a little more like a boutique. So today, I thought I would share with you how to make one for yourself! *I didn’t use one, but if I were going to redo this project, I would find an old large from from a thrift shop to go around the pegboard. Then head over to Lowe’s or Home Depot or wherever you like to go for home improvement items. -A can of your favorite shade of spray paint. 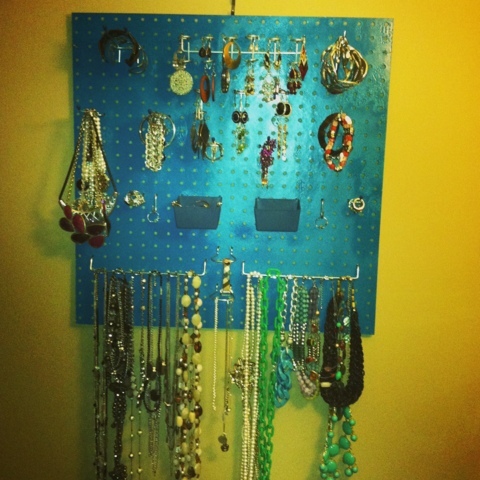 Before you leave, have your pegboard cut to the size you’d like! I liked the 43- piece set because it came with these little buckets. I use them to store my stud earrings and pins. 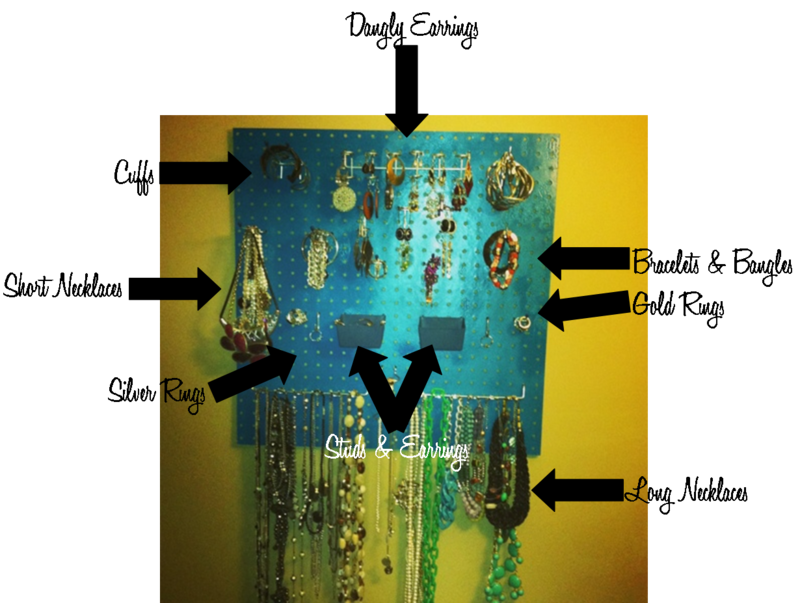 -Spray paint your peg board and let it dry. 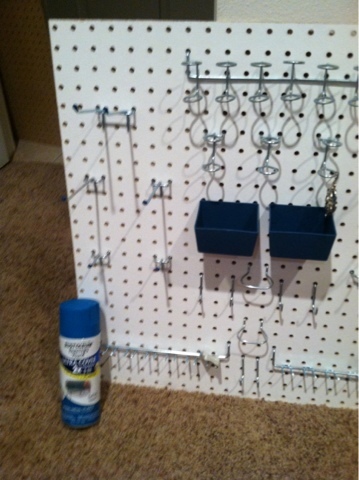 -*If you took my advice and got a frame, place pegboard into frame. fasteners that come with the kit. I didn’t, but I’m a bit of a daredevil. – Hang your fabulous new jewelry holder on the wall. – Adorn it with all your favorite jewels. 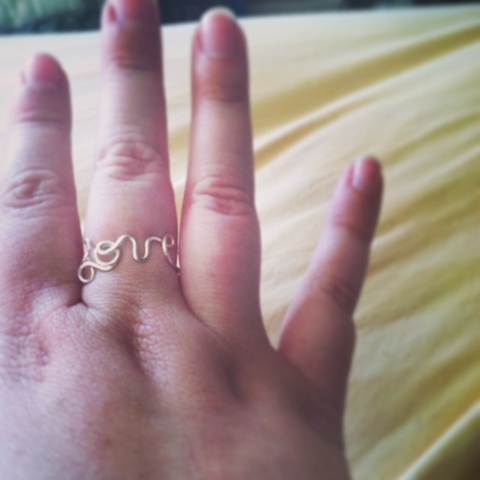 I got myself this ring. And I “love” it! Now all my jewelry has a home and I am just so happy when I accessorize in the morning! Thanks for the DIY craft! Love it. Found your blog through the giveaway! I LOVE this! You're so crafty!! I might need a few of them or a HUGE one!